So we have been trying to do some yard work and have gotten the garden planted and I have been searching the web for things that will pretty up the outside of my house. Spring is when I always think about how the outside looks! I came across some really cute address plagues at Mailboxandbeyond.com! I an an EMT and have worked on the volunteer fire department and know just how important it is to be able to see a persons address plaque. 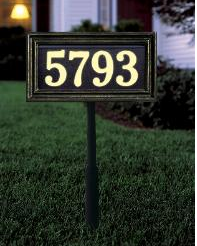 They even have a few address signs that light up! This one has an internal light sensor that automatically turns on at dusk and back off at dawn. It uses 8 D-cell batteries (not included) but it says it will provide 5 months of continuous nighttime illumination. It can be a wall mount or it comes with a lawn stake for street side! That would make it really easy for someone to find your home! I just think it’s cute! I believe anything that helps them find your home in an emergency is well worth the cost! 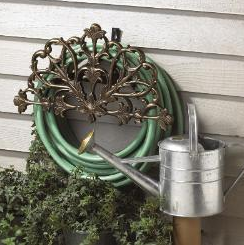 They offer tons of other items including house address plaque, plant hangers, garden hose holders, lanterns, bird feeders and sundials. As a matter of fact the list goes on and on. I really liked the light up address signs and the super cute garden hose holders! The best thing I found was they offer FREE shipping in the US! Yea!